Are you afraid to go in your own back yard? To let your kids play freely? To even leave your back door open - afraid a snake will come inside your home? With the recent weather events like the hurricanes in New Orleans (Flood waters displace snakes, rodents, ants) scientists are predicting that the eco system is going to be out of balance for a good long while. Snakes, lizards and even alligators are venturing out of their natural habitats in search of food and shelter. This poses a serious problem. You could try to kill any snake that you see but it's the ones that you don't see that are the real threat. You can't be a prisoner in your own home or be afraid to go to your own garden. Our customers say that SerpentGuard has been effective in helping them control their snake problems. 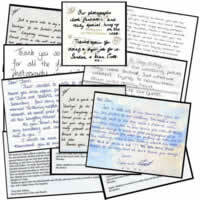 Scroll down the page and you can read just a few of our customer testimonials. If you need additional information on our product, testimonials, or references, please call us at (901) 870-7828. For continuous protection, we recommend spraying every 3-4 weeks starting in the spring through autumn. Under ideal conditions and regular application our customers indicate that SerpentGuard can be effective for up to 60 days! Since SerpentGuard is environmentally friendly (Material Safety Data Sheet available upon request) you may spray it anywhere you wish -- around pools and gardens, playhouses, barns and tool sheds, under rocks and decks, wood piles and crawl spaces. Take SerpentGuard camping, spray outside your tent at ground level! SerpentGuard snake repellent is highly concentrated. When diluted with plain water, and placed in any household spray bottle, only a small amount is required. All species of snakes have an extra sensitive taste and smell receptor known as Jacobson's organ. When snakes encounter areas treated with SerpentGuard snake repellent, they experience the unpleasant odor and bitter taste that the combination of the special ingredients blended together in SerpentGuard have been proven to emit. In general, most snakes in the continental United States are harmless (About Snakes); however, some snakes can be fatal. In order to deter the invasion of snakes we recommend keeping your property as clean and clutter free as possible. Do not provide hiding places. Keep grass mown short, as they do not like to be out in the open. Discourage rodents by storing stock feed in tightly covered containers. If, in fact, a snake bite does occur, try to remain as still and calm as possible. Tightly bandage the affected area, and do not wash unless you can positively identify the snake. Call for medical assistance-- driving is not recommended as adverse effects can come on quite suddenly. Even non-poisonous bites require medical attention as unpleasant infections are possible with wounds that fester and are difficult to heal. Q: Is SerpentGuard harmful to my plants? A: SerpentGuard is absolutely harmless to children, animals, and plants. All ingredients found in SerpentGuard ingredients are classified by the EPA as non-toxic. Q: How do I apply SerpentGuard? A. SerpentGuard is a highly concentrated liquid that you mix with water. One 16 oz. jug of SerpentGuard will make 2 1/2 gallons of repellent. Most people apply SerpentGuard with a garden sprayer. Any spray device or spray bottle will do. Complete mixing instructions are shipped with the product. Q: What if it rains, should I reapply? A. A simple shower will have no effect, however in the event of a hard washing carrying rain, you may need to reapply. Q: How quickly will SerpentGuard start to work and how long will it last? A. Our customers say that SerpentGuard goes to work immediately upon application and continues to provide protection for 3-4 weeks. An accumulative effect can occur with regular applications and our customers indicate that it can last for up to 60 days. Q: How much do I use? 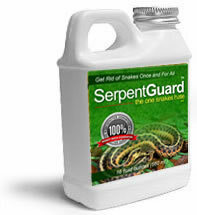 A. SerpentGuard snake repellent is a prepared concentrated liquid that is diluted with water. A very fine spray mist is all that is required. 2 and 1/2 gallons of the mixture will cover approximately 1/3 acre. Q: What is in SerpentGuard? A: SerpentGuard is a blend of only the finest natural ingredients available. It is manufactured under strict guidelines and classified as non-toxic and environmentally friendly. SerpentGuard ingredients are classified by the EPA as non-toxic. Q: Will it smell bad? A: Only to snakes. SerpentGuard snake repellent is a unique formula designed to target the extremely intense senses of smell and taste of the snake. Only snakes will find the odor offensive. "Southern California Snake Removal has been using this product over the last 5 years with a 100% customer satisfaction. While most snake repellents are fakes, we stand behind this product and put our name on the line! Since this product is not ours, Southern California Snake Removal does not give a 100% money back guarantee! If you buy the product from Serpent Guard, they will honor this deal! Southern California Snake Removal will apply this product to your property for an added fee. However if you like working in the yard? Serpent Guard is easy to apply!" "I am sure snakes have their place, but not in my pool please! Before using SerpentGuard I was always checking my pool for any surprise visitors. Now I just jump on in. Thanks!" "This stuff is magical! I love it! Thank you!! "Your product saved my sanity. Large garder snakes like to live in my back yard which is damp and faces south. They love to sun there. I need a new supply as soon as possible because I can't garden because I'm terrified of snakes. These are not little green ones - they're large to medium black with yellow stripes. Help!! "Thank you so much for providing such an awesome product which keeps me comfortable in my garden!!!" "I was just reading some of your testimonials of which I was one. I can tell you that my statement is grossly understated!!!!! I have used this product for 2 yrs now, and am so GRATEFUL to you and your product. You have no idea just how overwhelming our snake investation was last year (we have a large pond on our property and live in the woods to boot), I still keep my head down on the look out for the serpents, but ultimately, I have had no reptiles since I started using your product last year!!!" "Hey guys!!! Worked like a charm. We now have doves, cardinals, robins, squirrels, etc. roaming my back yard.... yaaaaaaaaaaaaaaaaaaay!!! And my border collie has quit digging on the hillside where the snakes used to be. SerpentGuard is backed by our unconditional one-year satisfaction guarantee. No questions and no hassles. SerpentGuard is absolutely harmless to children, animals, and plants. All ingredients found in SerpentGuard are classified by the EPA as non-toxic. Are you ready to take back your yard? We recommend spraying every 3-4 weeks starting in the spring through autumn. Under ideal conditions and regular application our customers indicate that SerpentGuard can be effective for up to 60 days! Select the SerpentGuard package that best serves your needs. One 16 oz concentrated bottle treats approximately 1/3 acres and it's effects last for approximately 60 days. Try two 16 oz. concentrated SerpentGuard get one free! Try three 16 oz concentrated SerpentGuard get three free!